The Akwa Ibom State Governor, Udom Emmanuel, has ordered the immediate arrest of the contractors and engineers that constructed the Reigners Bible Church International Inc, Uyo, which collapsed on Saturday, killing scores of people. Specifically, one of the personal assistants to the governor on media, Mr. Aniekeme Finbarr, who spoke with CNN’s correspondent Becky Anderson, said the governor gave the order on Sunday. “They should be made to answer certain questions so that the state would be able to get to the root cause of the matter,” the governor was quoted as saying. The governor’s call came on the heels of a similar call by the Senate President, Dr. Bukola Saraki, for a probe of the disaster. Saraki, in a statement by his Special Adviser on Media and Publicity, Yusuph Olaniyonu, on Sunday, commiserated with the people of Akwa Ibom over the incident. He also called for investigation into the cause of the collapse, which caused the death of scores of people and injured many others. While praying for speedy recovery for those still receiving medical attention in hospitals, he called for “urgent and thorough investigation to determine both the remote and immediate causes of the building collapse. Some survivors of the church building collapse have also given a first-hand account of how the building collapsed on Saturday. One of the survivors, Eno Etim, who spoke with our correspondent, on Sunday, said the building collapsed shortly after a lady was called to lead the praise worship. Etim, who hails from Mbo Local Government Area of the state, said there was no foreboding of the monumental disaster that was waiting to happen. The housewife, who spoke shortly before she was moved out of the St. Luke’s General Hospital, Annua, Uyo, to the University of UYO Teaching, Uyo, said the congregation was dancing when the church collapsed. She said that she could not recall how she landed in the hospital, adding that an iron bar hit her at the back, sending her reeling on the floor before she passed out. Explaining that she was not a member of the church, Etim said she had come to witness the ordination of the presiding pastor of the church, Akan Weeks, as a bishop, because they both belong to the United Intercessors Network. She said, “I was inside the church. Everything was normal; there was no problem. A lady was called to lead the praise worship session; the governor came in shortly after that. As the praise worship was going on, the building fell and I didn’t know how I got here. “The iron fell on my back forcing me to fall on the ground with my face down. Etim’s niece, Nkoyo Okon, said she was at home when someone called her and told her about Etim’s plight. “I knew she went to the church. But she later called me on the phone to tell me she had been taken to Annua hospital. So, I had to rush down here. 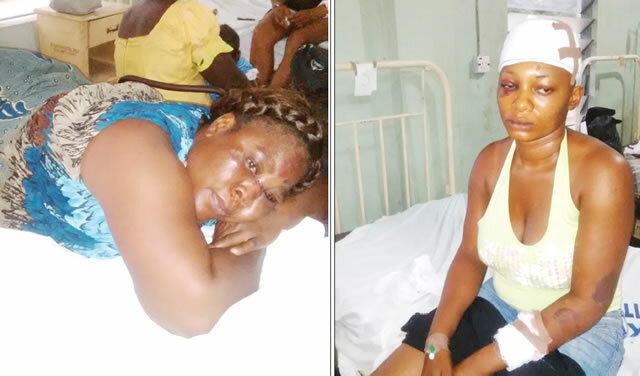 I’m grateful to God she is alive,” Okon said. Another victim, 22-year-old Emen Akpanitiat, said the building came down when the congregation embarked on praise worship when the governor came in. Akpanitiat, who hails from Ikot Mbonde in Itu LGA, said the church building collapsed while the congregation was dancing and singing preparatory to offering collection. Speaking to our correspondent, her sister, Emen Inyang, said the family was grateful to God for saving her life. “I was not in the church. I called her number and I was told that she had been rushed to Annua hospital,” she said. An aide to the governor, Essien Nduese, has revealed how the governor narrowly escaped from the disaster. Nduese, who is a Personal Assistant to the governor on Media, said an iron bar fell and shattered the seat the governor was sitting on. He debunked the insinuation that one of the governor’s aides was killed in the disaster, revealing that it was the man, who was handling the microphone during the event that was killed. The PA said the deceased was not on the entourage of the governor and was not in the employ of the state government. Nduese said, “He (the deceased) was not standing with the governor neither was he sitting behind the governor. I worked with the media team to the governor. The Commissioner for Information, Mr. Charles Udoh, and the Chief Press Secretary to the governor Mr. Ekerette Udoh, are in the hospital. “Ekerette has a dislocation in his left leg; he also has internal pains. He is better now though he is still in the hospital. According to Nduese, the governor said this at Qua Iboe Church, Ikot Ekpene Road, Uyo, on Sunday. He explained that the governor urged Akwa Ibom people to continue praying for the families of the deceased worshippers and refrain from negative comments that could further worsen the pains of the bereaved families. He said that the governor had declared a two-day mourning period in memory of the departed and for the speedy recovery of the injured. The National Vice-Chairman (South-South) of the All Progressives Congress, Hillard Eta, has commiserated with the families of those who lost their lives in the tragedy which occurred in the church. Also, the Governor of Lagos State, Mr. Akinwunmi Ambode, in a statement on Sunday signed by his Chief Press Secretary, Habib Haruna, also commiserated with the Akwa Ibom State Government and the families of victims of the Saturday tragedy. Ambode said, “It is, indeed, an unfortunate incident and words cannot really express our sadness as a government over the loss of several lives, who have become victims of an incident they know nothing about. “It is, indeed, a pathetic situation and we can only express our condolence and commiserate with the bereaved families over this incident. Ambode prayed that God would grant a peaceful repose of the souls of those killed in the incident and speedy recovery to those injured. The Edo State Governor, Godwin Obaseki, has commiserated with his Akwa Ibom State counterpart, Udom Emmanuel, and the people of state over the church building collapse which led to loss of lives. Obaseki also rejoiced with Udom on his survival, which he described as a miracle. Obaseki, in a statement by his Chief Press Secretary, John Mayaki, on Sunday, said, “We received with shock the sad news of the Reigners’ Bible Church building collapse on Saturday.